© 2018 Amazon Web Services, Inc. and its affiliates. All rights reserved. This work may not be reproduced or redistributed, in whole or in part, without prior written permission from Amazon Web Services, Inc. Commercial copying, lending, or selling is prohibited. Amazon Elastic Container Service (Amazon ECS) is a highly scalable, fast, container management service that makes it easy to run, stop, and manage Docker containers on a cluster of Amazon EC2 instances. Create a Task Definition, a description of an application that contains one or more Docker containers. 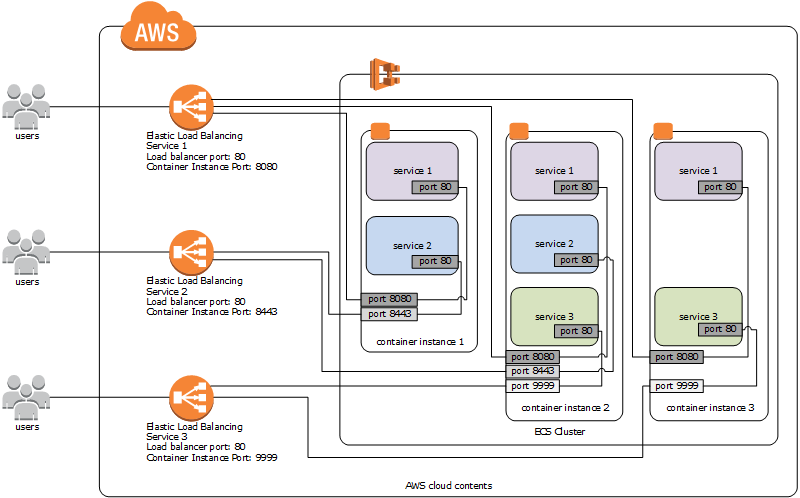 Create a Cluster, a logical grouping of Amazon EC2 instances on which you can place tasks. Create a Service, that allows you to run and maintain a specified number of instances of a task definition simultaneously. The lab environment will provide you with an Auto Scaling group of EC2 instances that you will use to populate the Cluster and an Elastic Load Balancer for use with your ECS Service. To successfully complete this lab, you should be familiar with Docker containers as well as general techniques and vocabulary of server administration and dev ops. You also should have basic understanding of web applications and networking, such as TCP port, HTTP Proxies, and Load Balancers. What is Amazon Elastic Container Service? Amazon Elastic Container Service (Amazon ECS) is a highly scalable, fast, container management service that makes it easy to run, stop, and manage Docker containers on a cluster of Amazon EC2 instances. Amazon ECS lets you launch and stop container-enabled applications with simple API calls, allows you to get the state of your cluster from a centralized service, and gives you access to many familiar Amazon EC2 features. You can use Amazon ECS to schedule the placement of containers across your cluster based on your resource needs, isolation policies, and availability requirements. Amazon ECS eliminates the need for you to operate your own cluster management and configuration management systems or worry about scaling your management infrastructure. Container Instance: An Amazon EC2 instance that is running the Amazon ECS agent and has been registered into a cluster. Cluster: A logical grouping of container instances on which you can place tasks. Task Definition: A description of an application that contains one or more container definitions. For more information, see Amazon ECS Task Definitions. Task: A single instantiation of a Task Definition. Scheduler: The method used for placing tasks on container instances. For more information about the different scheduling options available in Amazon ECS, see Scheduling Amazon ECS Tasks. Amazon ECS service: Allows you to run and maintain a specified number of instances of a task definition simultaneously. For more information, see Services. Amazon Elastic Container Service (Amazon ECS) is a shared state, optimistic concurrency system that provides flexible scheduling capabilities for your tasks and containers. The Amazon ECS schedulers leverage cluster state information provided by the Amazon ECS API to make an appropriate placement decision. Amazon ECS provides the service scheduler for long running stateless services and applications. The service scheduler ensures that the specified number of tasks are constantly running and reschedules tasks when a task fails (for example, if the underlying container instance fails for some reason). The service scheduler optionally ensures that tasks are registered against a load balancer. You can update your services that are maintained by the service scheduler, such as deploying a new task definition, or changing the running number of desired tasks. A service definition defines which task definition to use with your service, how many instantiations of that task to run, and which load balancers (if any) to associate with your tasks. Your Amazon ECS service can optionally be configured to use Elastic Load Balancing to manage traffic. 첫 번째 실습에 오신 것을 환영합니다. Amazon Elastic Container Service (Amazon ECS) is a highly scalable, fast, container management service that makes it easy to run, stop, and manage Docker containers on a cluster of Amazon EC2 instances. This lab leads you through the steps to create Task Definitions from Docker containers, populate an ECS Cluster with Load Balanced EC2 Instances, deploy Tasks to the Cluster, make revisions, and scale up the Cluster.